>> Why Do Kids From Good Families Walk Away From the Faith? 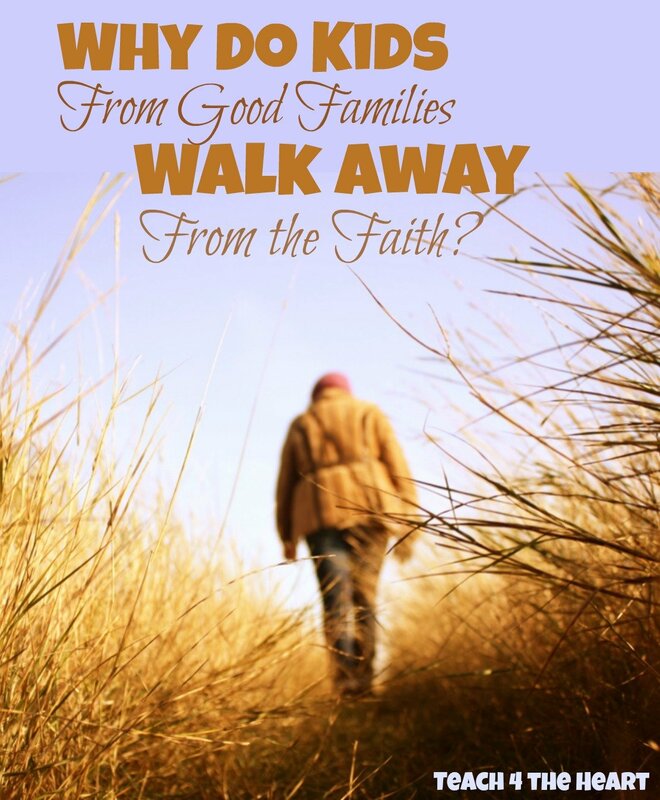 Why Do Kids From Good Families Walk Away From the Faith? What causes Christian teens from good churches and good families to leave the faith as an adult? This question plagues parents, teachers, pastors, and youth workers. And I’ll be honest – I don’t know what the answer is. I do know I’ve seen too many of my friends and classmates either slowly drift away and get out of church or disregard the faith completely. It’s tragic and sad – and it makes me wonder why it happens so often. Proverbs 22:6 says “Train up a child in the way he should go, and when he is old, he will not depart from it.” There is much debate over this verse (is it a promise or just a proverb?) but it seems pretty straightforward to me. The question we then run into, though, is why do kids from good Christian homes turn away from the faith? Maybe (and as I said, I don’t really know), they were never really trained. Just sending kids to church, praying at the table, and having lots of rules isn’t training. Maybe too many of us aren’t doing all we can to pass on our precious faith to the next generation. I don’t know why it happens so often, but a few thoughts come to mind. The faith they see isn’t real. Young people have an innate sense to detect hypocrisy, and being fake is the unpardonable sin in their eyes. And rightly so – how can you learn from someone who isn’t being authentic with you? Hypocrisy in the church and home comes in various forms, and I think more of us are part of the problem than we care to realize. When we stick to old rules that have no basis in Scripture and the only explanation we can give our kids for them is a combination of stammering and canned lines, our kids can tell that this aspect of our faith is not real. Or when we put up a good front in an attempt to “be a good example” instead of being authentic about our struggles, this turns kids off. Quickly. And we also lose the opportunity to show them how real and life-changing our faith truly is. They get a distorted view of Christianity. Many churches (or homes or schools) lean too far to one side or the other. Some speak of love and grace so much that they neglect to preach against sin and its consequences. Others take strong stands against unrighteousness but fail to properly demonstrate God’s love and grace. Neither of these one-sided approaches rings true because both grace and truth are integral to the faith. We must teach young people the whole counsel of God – the true amazing paradox of Christianity. They aren’t properly discipled. I think this one is huge. In order for kids to truly make the faith their own, they need to be intentionally discipled – and that means that the parents (and hopefully also teachers, youth workers, etc.) have a strong relationship with them and talk to them about every aspect of their lives. They must speak to their hearts – truly digging down to the heart issues in every encounter. And when disciplining, yelling or just issuing a punishment doesn’t cut it for a teenager. Yes, they may “learn their lesson,” but their heart won’t be changed. True discipleship takes lots of time and effort, and it’s a daily process. I don’t think this happens in a lot of homes, but I think that if it did, far fewer teens would go astray. They fall into the trap of the slow fade. Up to this point, I’ve suggested that a lot of the blame belongs to the parents and other influences in their lives. But in reality, each person makes his own decisions. And from what I’ve seen, for many it’s simply a slow fade – one small decision away from church followed by another and another. Each seems insignificant and not that big of a deal, until suddenly they’re far away. Only it wasn’t suddenly – it was a gradual decline – one small step at a time. I just can’t end on that depressing note. If these are some of the contributing factors (and I think in many cases it’s a combination of them), that’s good news because we can make a huge difference in the next generation by reversing these trends. We can be authentic, give them a true view of Christianity, and help them develop a personal relationship with God. We can take the time every day to disciple them and warn them about the trap of the slow fade. This is one of the highest callings we have as Christians. The Great Commission commands us to make disciples of all nations – and we simply cannot neglect to make true disciples of our own children. What do you think? Are these factors contributing to the problem? Why do you think young Christians turn aside? What can we do differently to successfully pass on our faith to the next generation? Should Teachers Leave Their Faith at Home? Linda, your comments are right on target. Too many Christian parents leave the teaching and discipline to the church but as we know, it takes DAILY reinforced teaching from God’s Word to keep our children from ‘walking away from their faith’ as they become responsible for their own actions. Linda, I think your article was very good. I just would like to add that training and raising our children for The Lord needs to be done diligently day by day totally depending on God for guidance and wisdom and help. Every single day I prayed for each of my children and begged God to keep them close to Him. As a young mother I was scared when I saw so many teens start getting into worldliness and going away from The Lord. That is when I started searching the scriptures and going to God continually for help. He always showed me and gave me comfort through his word. As you said in one of your points that children need to see true Christianity lived out in the home; not perfect parents but real parents that admit they are wrong when they are, parents that spend time with their children and get to know them by showing they care about them and what they are going through in life. I always promised God from the time I got saved that I would never let my Christianity become a religion and that everything I do for the Lord would be based on Gods word and my relationship with Jesus and not on what a man tells me to do and I taught my children this also. Hi Linda. These are some great points. In the “To Live is Christ” study (I’m pretty sure it was that one…) Beth Moore discusses this a bit in one of the videos and it was really encouraging. She was speaking to the hearts of mature parents who did everything right and their adult children turned from the faith. She made the point that “They will not depart from it” could mean that though we do everything right, the decision is that individual’s and is between them and the Lord. If you did everything you know is right and they still wander, rather than live in guilt and defeat, know that your teaching WILL always be in their heart. Even if they live a life of no faith, they will know in their heart where they are failing. They will know that there is a better way even if they don’t choose it. I thought that was a really interesting perspective (and hope I’m doing it justice!) and also offered some hope to parents who hurt over their children’s choices. Thanks for blogging on such important topics! Sadly too many Christians refuse to acknowledge the actual reasons and instead weave all sorts of non sequiturs and rationalizations for loss of faith among today’s youth. If you ask young skeptics directly most will tell you that they find no credibility in Christian belief system, it’s outrageous claims, and ultimately consider it irrational and untenable. There are a great many of young people (myself included) who didn’t lose their faith lightly but after considerable introspection and thoughtful inquiry. I therefore find it somewhat condescending that you think our rejection is based on a distorted view of Christianity. That somehow if it were properly presented, we’d embrace it. Nope… we actually reject Christian claims and it’s dogma because we don’t find the Christian God to be real and do find the stories to be fabrications, myths and fables or embellishments. And…it’s not you Christians we have a problem with, it’s your beliefs. Joe, I hear you. I agree that Christians who do not have the answers to real-life questions are fake. And that a Christianity that does not have the answers is just a fairy story or myth. When you say that you don’t find God to be real, I wonder if you are asking why a good God would let bad things (cancer, sickness, death) happen? I think you are a well educated young man, and need answers to your questions. Everyone believes and trusts in something, whether it be themselves (humanism), or some other belief system. “Where did we come from?” “What happens after we die?” “What are we here for?” are questions that everyone needs to answer. Some believe that evolution has proven that we don’t need a god to explain the origins of the universe. Good on you for your introspection and inquiry into these big questions. As you continue to wrestle with them, you may find ‘The Answers Book’ edited by Don Batten helpful. Also http://www.creation.com welcomes questions such as these. Most parents still have no idea that the very concept of ‘Truth’ is challenged not just every day, but every moment of every day, in a thousand different ways. John Dewey is widely regarded as the father of modern education, … read up on him some time and see what post-modern education really intends to teach our children. Modern education teaches that their is no fixed truth, that truth is just a matter of opinion, that truth is merely tossing about like waves on an ocean. i think children may depart from christianity because of the “no queastions, no doubting, God said so, you don’t need to know why ” approach, parents have with their children. because parents don’t want their children to stray, they are on the look out for signs of “rebellion”. and when their kids bring up honest questions wanting to understand, they are shut down, with a “that’s just how it is” answer. this is the weapon that the devil will use against you. because most of the attacks of atheism on chrisitanity is that people don’t think and question, the child will first of all say no, then slowly they’ll begin to remember how their questions and doubts were waved off in the past. and then it will look like the point atheists are trying to make is true. Do we think that God is so small that he can’t withstand questions and doubts? even the bible doesn’t encourage a “i believe without proof” stance. you’re supposed to try your faith, test it out. Thank you for this article Linda. Other similar Biblical verses come to mind with this Proverbs one: 1) Deuteronomy 4:9-where GOD asks ‘what other set of laws and ways will you ever find that compares to mine?’ (we have over 1 trillion here is the USA, and look where we are). I remember my old pastor talking about how the Ten Commandments were laws of love; Christ gave us so much more than those TEN, didn’t He? If we can see GOD’s love in His laws, and in His deep desire to provide for us, His Laws can become more than just something to obey. I love your article on How to Fall in Love with GOD. 2) Deuteronomy 11:19 ‘you shall teach your children when you rise all the way till bedtime, talking about GOD,His Laws, His provisions, His Holiness, and His love…and how He wants US to emulate that for our children, who are a gift from GOD. (back in Jesus’ days on Earth, boys emulated their fathers, learning their trade while daughters learned not only everything on how to run a home and take care of children, but amazingly they were ready, as Mary was, at the young age of 12 to marry a man who was at least 30! On top of that, it was a big deal for these girls to be virgins, and there were those who would verify that; amazing huh?, we’ve landed men on the moon, but could you imagine how hard it would be to change this present world to that way of life? Just imagine if Christ tasked you with that duty, what would need to happen to bring about that change. I think the bottom line is this: we have the majority of children rejecting Christ today, because we didn’t desire to be Enochs, and said too many ‘oh well’s, letting the world slowly fade away, like your point #5, into what it is today: a world of feeling good, pursuing happiness, experiencing the life of The Rich Man…and not warning, as Jesus Christ, as even the Rich Man from Hell, did so well. The implications in the question are rather insulting as it seems to assume that not holding the Christian faith is a deviation from “good”. Whether or not we came from “good” homes has little to do with the belief systems we end up believing. It really is a much more of a cognitive decision than a moral one… a process rooted a great deal of thoughtful inquiry and personal introspection. As a young atheist I simply found Christian claims for miracles and the supernatural to be untenable, irrational and wholly unbelievable. I feel it safe to say, that is why most “kids from good families walk away from the faith”. Respecting a grown child’s faith boundaries is very important. No one wants to spend time with someone who lectures and shames. Sometimes God ways of dealing with that child are much wiser. At some point you love them, pray for them and give and give them to God. A child is loved back into faith faster than he is “disciplined” back into faith. (Chances are your child “knows” you are disappointed in their faith life.) Live your faith with joy. Your child needs your grace now. Chances are he or she did not experience “God’s grace” in the past. And Grace is irresistible. Lost son. Heartbroken. Thanks for the article for encouragement. So sorry to hear this, but glad the article was encouraging. God bless you!